At first I thought this would be your ultimate daddy’s car. Drives hard and fast when you are alone but carries your next-of-kin with all their their belongings if that’s on the agenda. Sounds ideal, doesn’t it? I like the concept of sports wagons. They provide a credible answer to a handful of real-life issues that I face every day. Our family car (like most family cars, I assume) is primarily a user, carrying people and luggage of all sorts of shapes, sizes and numbers. Sometimes it doubles as a van, other days there is just a school run and that's it. However, once in a while, I wouldn't mind getting some fun out of driving it, and that's where our car, like most typical family vehicles, draws the line. Driving enjoyment presupposes things like a proper suspension, a powerful engine, a slick gearbox and so forth, and regular everyday cars just don't come equipped with these. 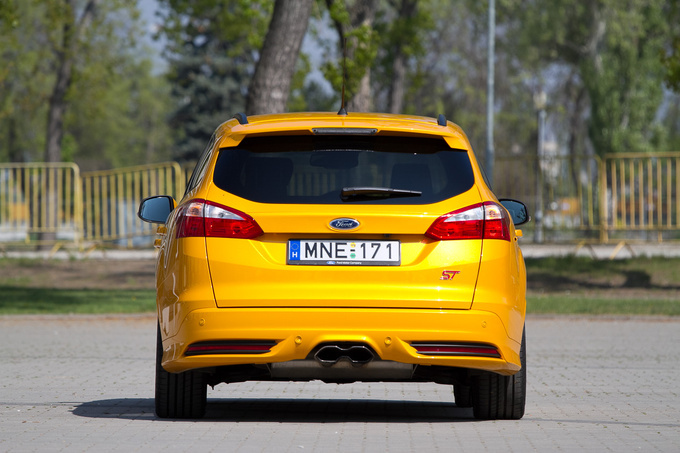 This Ford, however, is a station wagon with 250 PS that is supposed to be a heap of fun. It also looks good. Which is kind of strange because I generally cannot stomach the third generation Focus. I adored the first one, I still do actually. The second is kind of meh, I have nothing against it but nothing for it either. But this current one I just cannot find attractive. I am greatly disturbed by the rear light cluster, shaped like an amoeba, and the stacked front grille with the narrow slit over the gaping mouth. It's all overplayed, chaotic. 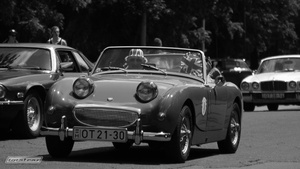 Sure, it was meant to be a global car and needed some visual oomph but it's just too much for my unsophisticated taste. There is, however, a single model version where both of these uglies are gone – this is the one. Station wagons have a regular rear light cluster, and the ST version only features the lower air inlet, giving this specific car a head start in my review. Also, this wagon has been designed with proper attention to detail, unlike fellow estates that seem to have been extended and then chopped off at an arbitrary point. The overall shape of the Focus Station Wagon is homogeneous and balanced, only disturbed by the demands of front wheel drive. The nose portion is slightly longish, but you won't notice that unless you spend time observing the silhouette. On the other hand, it is dynamic, aggressive and even eye catching with this bug magnet of a yellow paint job. If it wasn't for the yellow taxi cabs making people immune to the colour, this Ford would look even more spectacular. Even so, it has managed to seduce quite a few admirers – maybe they have realised this yellow is a darker, richer tone with a tinge of orange. Of course every great shape comes at a price in the automotive industry: outward visibility ranges from acceptable to dismal, depending on your physical build. The optical sensors installed in the top middle section of the windscreen, together with the A-pillars block quite a significant percentage of your view. Let us be fair though, this has become the norm in today's auto industry. 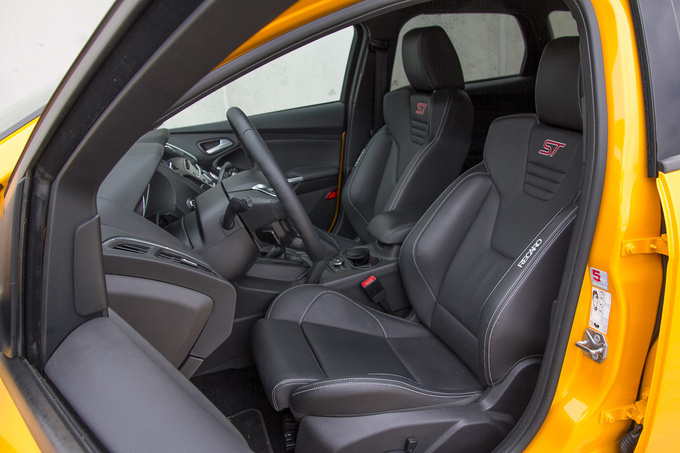 On the other hand, the all-black interior is sub-par; it is downright depressing compared to the lively yellow of the exterior. All upholstery and plastics are pitch black, making the dark grey surround of the instrument cluster a welcome sight. Sure, you can get used to the gloom in a day or two but it would have been nice to see some orange stitching here or a highlight there. 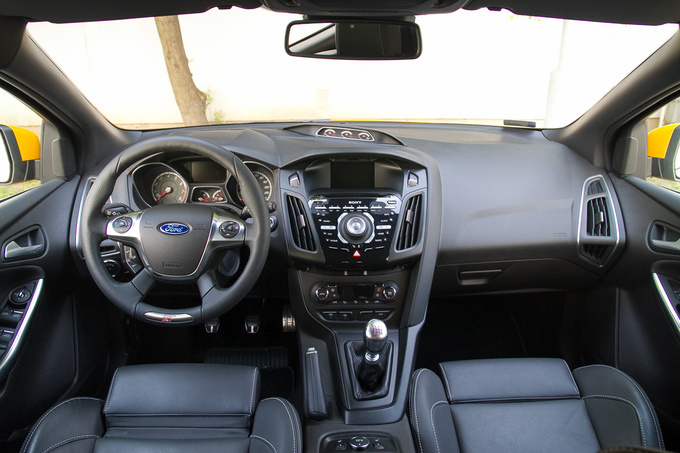 The Focus is not particularly spacious, and the ST Wagon is no exception. It is acceptable up front, although the edges of the seats could be set further apart, but there wasn't enough room in the back for me to sit without straddling. Making matters worse is the uncontoured, flat cushion that – with its leather cladding – threatens to send you skidding sideways if the driver is in a spirited mood. The 490-litre boot is far from being the most spacious in the segment but it isn't exactly small either; to tell you the truth I was more concerned with how the ST drives than with gauging the capacity of the trunk. I was so focused I could look beyond the awful clutter Ford calls a central console (luckily this will be gone during the upcoming facelift) with my mind set firmly on other things as soon as I got rolling. 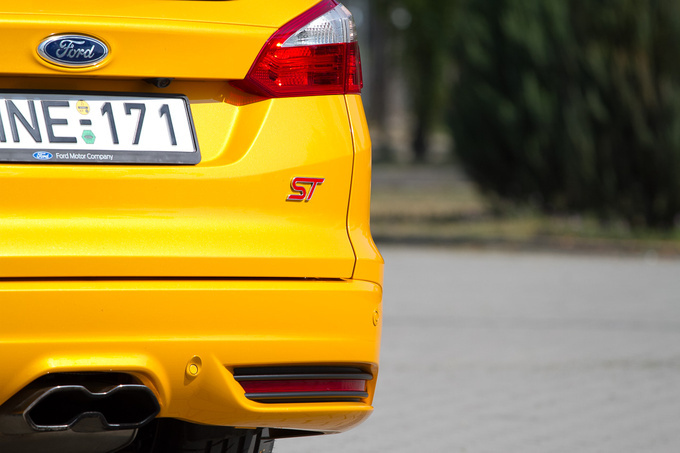 The first thing that gives the ST away as a sports wagon is the sound coming from the 2.0-litre turbo engine. At some point between 2500 and 3000 rpm a valve opens up within the exhaust system and channels exhaust gases towards the acoustic chamber located right behind the instrument panel. The resulting noise is an unpleasant, loud murmur, more akin to the rumble emanating from cheap exhaust fix-ups rather than the majestic growl of a properly tuned sports engine. You can get used to it but I preferred to keep the engine outside of these rev ranges by shifting up early. This turned the ST into a flawless, albeit blunt station wagon with a somewhat stiff suspension, a pleasant amount of torque and a distinct lack of driving enjoyment. What, no enjoyment? Unfortunately, no, because as soon as you try to get those 250 horses prancing you will be deterred by the rumbling exhaust. The engine feels incredibly powerful, which is good, but the six-speed manual gearbox shifts heavily, although pretty precisely. It felt like I was playing see-saw with a cannonball; swift shifting necessitated some muscle work, like in the good old days. 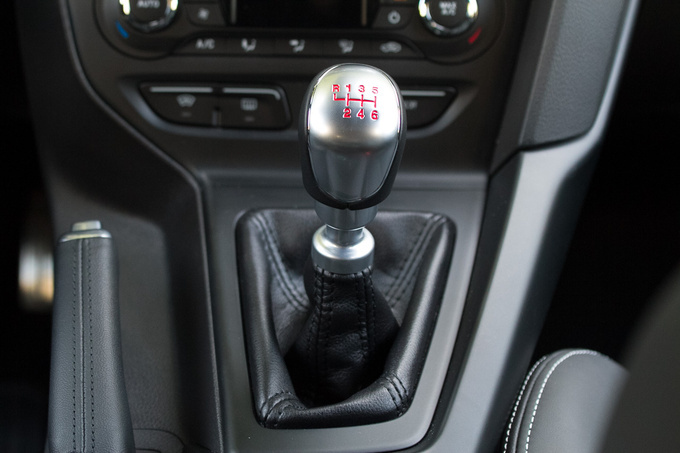 Ford has demonstrated its ability to build genuinely good gearboxes, which makes this all the less understandable. But there are good things too, such as the awesomely balanced middle-of-the-road chassis. It is just firm enough to make you feel confident in faster-then-ideal corners, but it does filter out some road bumps, unlike other hot hatches. Too bad you won't be enjoying the suspension because Ford has decided to leave the most important ingredient out of the equation. 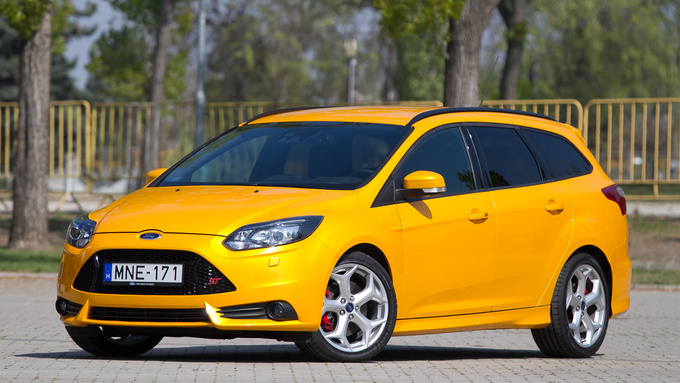 This is what prevents me from wholeheartedly recommending the Focus ST to anyone. Here's my gripe: you can drive this car fast, but it won't feel good. You have 250 PS and 340 NM but no means of getting it reliably to the tarmac. Powerful front-wheel-drive cars, say, above 160 to 180 PS (the exact value depends on the weight of the car and the type of suspension employed) tend to wrestle the steering wheel out of your hand if you wish to accelerate out of a corner. This is not a new phenomenon and there are plenty of effective solutions to the problem. Of course all-wheel-drive would be ideal but you can also control it with anLSD or the RevoKnuckle front suspension used in the previous Focus RS. 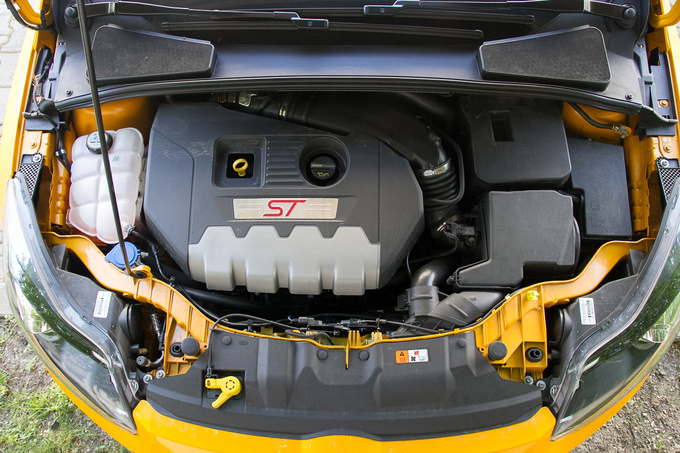 However, the ST features none of these; instead, engineers attempted to filter out torque steer via the electric servo steering, and that is anything but effective. Hypothetically, steering resistance should weaken in the direction of your steering effort when you accelerate. 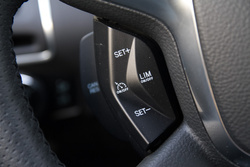 However, the drop in resistance is not proportional to the degree of turning, so if you turn the wheel ever so slightly and step on the gas without keeping a firm grip on the steering wheel the car will drift towards the inside line, as much as a car's width. It's like the car has a mind of its own, overwriting both your intentions and the laws of physics. The only way to counter this is to concentrate, hold the steering wheel with iron fists and keep countersteering which is a drag, really, even in the short run. It's like the car is intentionally trying to create a hazardous situation, insinuating that you'll never be able to handle this much power. The only way to put an end to your anguish is to lift off the accelerator. I have driven more powerful FWD cars, and none have given me this much trouble, even though I usually drive much the same test route to keep my findings comparable. And that's a real shame, given that the engine is a gem, road holding is excellent (minus torque steer), the gearbox shifts precisely – the car has everything you need for an excellent drive but Ford was trying to save a few hundred Euros keeping the chassis and the differential gear simple. 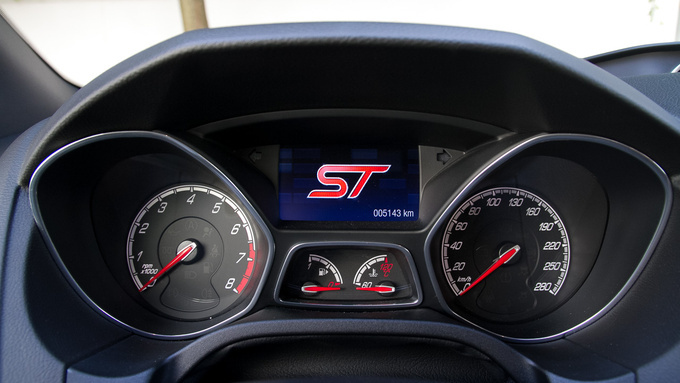 And this means that with all the favourable assets the ST Wagon has to offer, among them a relatively low average consumption of 12 litres/100 km despite being driven hard, the car is just not able to deliver on the single promise it offers above and beyond any plain Focus Wagon, namely the feeling of carefree driving. 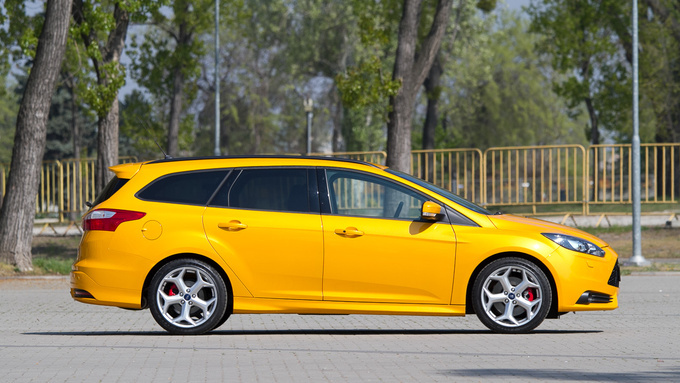 What a disappointment after looking so good on paper, trumping the Renault Mégane Estate GT and Škoda Octavia RS Combi (both 220 PS), making the Ford the most powerful compact wagon available at the moment. If you choose this car in the more modest ST2 specification you'll fork out about €29,400, while ST3 models like our test car cost $31,400. Unfortunately there is no optional LSD to be bought, and getting an aftermarket one is likely to void your warranty. Still it's nice to know that for about €1500 you can pick one up for the ST, giving you the possibility of turning your Focus ST, an almost nice car, into a better balanced one. Of course, in order to achieve that you'll also need to replace the steering servo. As for the future, let us hope Ford remedies these issues when the Focus undergoes a facelift this year. Hot or not? You tell us! Weekly vote-site of our daily Facebook question. From 17.03.2014 to 23.03.2014.